Some dieters avoid protein because many protein-rich foods are high in fat and calories. But there are healthy ways to get protein in your diet and still lose weight. Use these tips to eat the right amount of protein for weight loss and good health. Will Protein Help You Lose Weight? People usually expect to get hungry when they go on a diet to lose weight. But if you eat more protein, losing weight doesn't necessarily mean going hungry. Good sources of lean protein can help you to feel full and satisfied during the day, which may help to curb your cravings so you lose weight faster. Sarah Berndt, MS, RD, CD, CPT is a registered dietitian and certified personal trainer. She explains that not only does protein improve satiety—that feeling of fullness—but lean protein also helps to stabilize blood sugar, provide immune support, and helps you to maintain a healthy metabolism. So how do you get enough protein to lose weight? Sarah suggests getting some form of protein at every meal. These are just a few ways to get creative and include protein at each meal, during snack time and even at dessert. Make Cooking Protein Easier One of the most common reasons that people don’t eat more protein is that it is too hard to prepare. Let’s face it, meat doesn’t microwave well. But there are many inexpensive counter grills that make grilling meat easier and healthy. The George Foreman Grill is a brand that is popular with many dieters. Sarah also points out that grilling is a good way to prepare food without too much fat. In addition to chicken, Sarah suggests grilling turkey, lean pork, lean beef, and even tofu. Get Creative With Egg Whites There are countless ideas for healthy omelets and egg white scrambles that are popular with smart dieters. But you can also get creative and make a healthy veggie and egg frittata on Sunday night and portion it out for lunch during the week. Unlike meat, eggs do microwave well and they are easy to carry to work in single-serve containers. In addition, you can add cooked egg whites to other foods you might not typically consider. Throw scrambled whites into tacos, diced cold egg whites into a three bean salad or sliced hard boiled egg onto a sandwich. Egg whites have a very little flavor so you can add them to almost anything without changing the taste. Pick Veggies With Protein In general, animal sources have more protein than plant sources. But that doesn’t mean that the protein content in vegetables can’t contribute to your overall intake. Some veggies are better than others. Good vegetable sources of protein include broccoli, spinach, kale, cauliflower, and asparagus. Some fruit even contains protein. A banana, for example, can contain up to 2 grams of the nutrient. Beans and nuts also make good snacks because they are easy to cook in advance and carry around. Just be careful about choosing the best varieties. Canned beans are fine, but many contain added salt and sugar. If you can make the time to cook your beans from scratch, you’ll be better off. And choose nuts that aren’t heavily flavored or salted. Eat Protein for Dessert Believe it or not, you can even include protein in a healthy dessert. Low-fat yogurt with fruit is a great example. 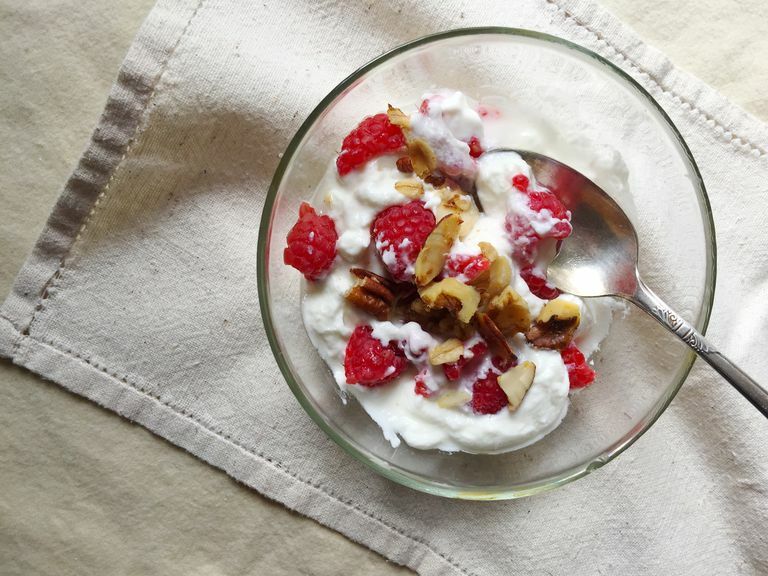 Greek-style yogurt tends to have more protein, but remember to eat this sweet treat in moderation (both the frozen and refrigerated varieties) as some of the brands and flavors contain quite a bit of sugar.